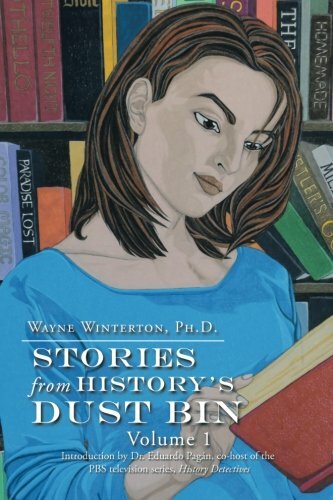 Through educated yet casual writing and an organized and easily accessible layout, Wayne Winterton’s non-fiction short story compilation, Stories from History’s Dust Bin: Volume I, provides readers with little-known tidbits of information and noteworthy events, and other unusual true-story episodes on various figures in history (some famous, others only known for their name, and many not found in average history textbooks). Organized through days of the year (ranging from January to April), these historical narratives are easy to digest, written with an idiosyncratic writing style and intelligent yet straightforward presentation. The stories are fun to read anywhere and anytime. Whether one leafs through the book looking for a historical fact relevant to the day, or it is read over time in chronological order, this book is filled with a plethora of interesting stories that even many history buffs have likely never heard of before. Winterton’s book has the ability to appeal to a variety of ages. Although, due to possibly disturbing subjects (such as murder) touched upon in of some of the vignettes, this reviewer would generally recommend it to ages eleven and up. However, this advice should be taken subjectively, as the adequate age-range will depend upon each reader’s maturity and tolerance levels, as with almost any book involving human history. With a variety of stories, from unknown insight on renowned historical figures, little-known stories of murder, or origins of well-known products or languages, this book seems to have at least one thing for everyone. It would make a wonderful gift due to this versatility. Stories from History’s Dust Bin provides readers with handy little-known history facts and tales that one can use to further their own knowledge or share with others (family, friends, classmates, or coworkers!). Whether enjoying on one’s lunch break, a bus ride, or at the pool, this selection of historical anecdotes can keep one amused for short to long periods of time, depending on how it is read. There is a possibly disturbing story involving murder that may be unnerving to a seven year old but would likely be tolerable for a 10 year old.